Here we look at a few of the unusual incidents that some have called “miraculous,” although none has been accepted as such by the Catholic Church. Like many public controversies, the debate can be better informed by scientific evidence; however, there is no legitimate scientific controversy over the safety of GMOs. Did Television Introduce Anorexia to Fiji? The widespread assertion that the world would be better off without religion is a reasonable hypothesis. Yet data suggest that skeptics should attach no more than a modest level of probability to it. The modern practice of witch hunting in India includes violence and beliefs that have led to the torture and murder of alleged witches. State governments and rationalist groups are trying to address the problem but face big obstacles. 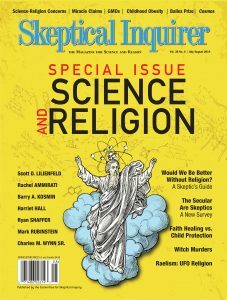 If religious believers had a better understanding of scientific methodology and nonbelievers had a better understanding of its parallels with religion, they could have more meaningful discussions with each other. Thermal Imaging: Cold Hard Facts or Just Hot Air?